These amazingly comfortable bras and underwear are perfect for all stages of motherhood! The bras come in two sizes based on band size and fit cup sizes A through D/DD - so they eliminate the need to buy multiple sizes as your body changes throughout pregnancy, breastfeeding, and beyond! 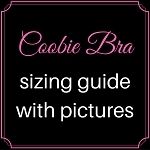 Additionally, many women find that even the bras that are not specifically "nursing" bras are still quite easy and comfortable to nurse in :) Please note: Please see our Coobie Bra Sizing Guide for comparison pictures as well as customer feedback on sizing.